In the final step prior to fermentation, the wort is pumped into a special heating tank called the brew kettle. It is here that the wort is boiled and other important reactions occur.Be-fore the wort is heated, however, one more essential beer ingredient, hops, is added to the wort. Hops are derived from the plant Homu-lus lupulus (in the family, Cannabinaceae), and although they were not part of the "original" beer formula, they have been added to beer since the Middle Ages. Why hops came to be used in beer making is not known, but it seems likely that they were added as flavoring agents, then later additional benefits were realized. Hops provide two main sensory characteristics to beer—flavor and aroma.A large number of different hop cultivars or varieties are commercially available, and they are distinguished mainly on the basis of their aroma and flavor properties. By far, the predominant flavor is bitterness, which is due primarily to the presence of a-acids, such as humulone and co-humulone, that are contained within the resin fraction. Although another group of related compounds, the p-acids, are also found in hops and also contribute some bitterness, the a-acids are the more important group. In fact, brewers usually select hops based on their a-acid content (as a function of the whole hop weight), which can range from 5% (low bitterness) to as high as 14% (very bitter).While the intact a-acids do impart some bitterness, they actually serve as precursors for isomerization reactions (see below) that result in formation of the main iso-a-acids, isohumulone and iso-cohumulone, which are considered the real bittering compounds. The amount of bitterness ultimately contributed by the hops is expressed in terms of International Bitterness Units (IBU). One IBU is approximately equal to 1 mg of iso-a-acids per liter of beer. Most U.S. lager beers have bitterness intensities of less than 15 IBU, compared to nearly 50 for some of the ales produced in the United Kingdom (hence, the name "bitters" for a typical British ale). The other major component of hops is the essential oil fraction.This fraction,which is com prised of various terpenoids, esters, ketones, and other volatiles, is responsible for the aroma or bouquet properties of hops. Most of these substances are volatile and, if added at the beginning of the kettle boil step,would mostly be lost by the end of the step.Therefore, when high-oil hops are used (when the brewer desires a beer with a strong hoppy aroma), the hops are usu ally added near the end of the kettle boil step. In addition to providing flavor and aroma characteristics, hops also enhance preservation and increase shelf-life of beer. This is because the iso-a-acids formed during isomerization have considerable antimicrobial activity and inhibit lactic acid and other bacteria capable of causing beer spoilage (Box 9-4). It has long been known that beer is less prone to microbial spoilage than many other aqueous beverages.Thus, in some situations, beer has historically often been considered better preserved than even water (e.g., the Pilgrims on the Mayflower). It is now known that the preservation properties of beer are due to the presence of several components or constituents that are inhibitory to a wide variety of microorganisms.Ethanol concentrations above 3% and pH levels below 4.6 are particularly inhibitory to spoilage organisms. Carbon dioxide, low oxygen levels, and limiting nutrient concentrations also restrict growth of microorganisms.The hops are, perhaps, one of the more potent antimicrobial constituents in beer, and are, in large part, responsible for its long shelf-life.In particular, hops inhibit many of the lactic acid bacteria that spoil beer due to their production of acids, diacetyl, and other products that confer flavor and aroma defects. Although the antibacterial properties of hops, and the a-acid fraction, specifically, were recognized more than seventy-five years ago, the physiological means by which hop acids inhibit spoilage bacteria in beer has only been determined recently (Sakamoto et al., 2002, Simpson, 1993). As shown in the model below (Figure 1A), the mechanism is actually similar to how other weak organic acid preservatives, such as benzoic and propionic acids, inhibit microorganisms in foods. Hop acids, like other weak acid preservatives, have ionophoric activity and are inhibitory due to their ability to decrease intracellular pH and to disrupt proton gradients. Given the low pH of beer (<5) and their low pKa (3.1), isomerized iso-a-acids are in their undissociated or acid form (abbreviated as HA), and hence, are able to diffuse across the lipophilic cell membranes of spoilage lactic acid bacteria. Since the cell cytoplasm of these bacteria is near-neutral, the iso-a-acids dissociate, releasing the anion (A-) and a free proton (H+).The latter then lowers the cy-toplasmic pH. The cell may respond by activating ATP-dependent pumps that efflux the accumulated protons, but the continued proton cycling is expensive (energy-wise) and also may lead to dissipation of the pH gradient portion of the proton motive force (the PMF or proton gradient) that the cell uses to drive various transport systems.Thus, energy depletion, cytoplas-mic acidification, and reduced nutrient uptake all occur as a result of hop-derived a-acids and account for their inhibitory activity. 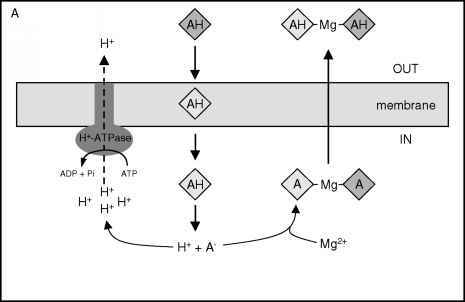 However, it is possible that a second mechanism also may be involved, because it appears that the dissociated form (A-) of the a-acids binds to cytoplasmic divalent cations, such as Mg2+, and the entire complex is effluxed from the cell.This results in the loss of a necessary nutrient that must then be re-transported, with the concurrent cost of energy. Despite the effectiveness of hop a-acids as antimicrobial agents, some bacteria have been isolated from spoiled beer that appear insensitive or resistant to hops. At least three resistance mechanisms have been identified (shown in Figure 1B as dashed lines). In Lactobacillus brevis, a common spoilage organism, resistance is mediated, in part, by two multiple drug resistance (MDR) systems. Both consist of membrane-integrated proteins.The HorA system is classified as an ATP-binding cassette (ABC) transport system, using ATP hydrolysis to drive efflux of iso-a-acids.The MDR system also pumps out iso-a-acids, but uses the PMF as the driving force.A third system relies on increased activity of the proton translocating ATPase (H+-ATPase) to pump out accumulated protons. Figure 1. 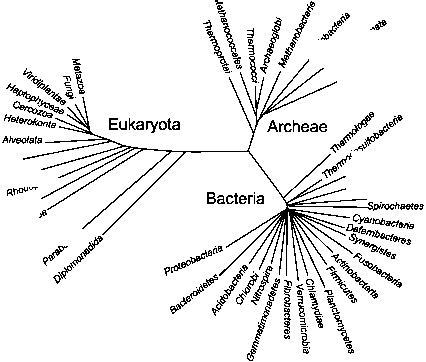 Inhibition of lactic acid bacteria by hops. In A, the means by which hop iso-a-acids inhibit sensitive organisms is shown. A model for hop resistance is shown in B. Adapted from Sakamoto et al., 2002 and Sakamoto and Konings, 2003. Sakamoto, K., H.W. van Veen, H. Saito, H. Kobayashi, and W. N. Konings. 2002. 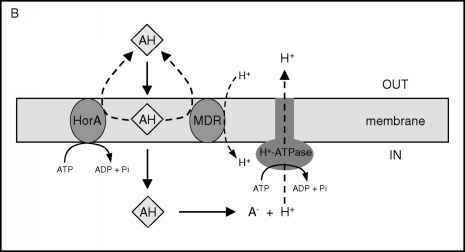 Membrane-bound ATPase contributes to hop resistance of Lactobacillus brevis.Appl. Environ. Microbiol. 68:5374-5378. Sakamoto, K., and W.N. Konings. 2003. Beer spoilage and hop resistance. Int.J. Food Microbiol. 89:105-124. Simpson, W.J., 1993. Ionophoric action of traws-isohumulone on Lactobacillus brevis. J. Gen. Microbiol. 139:1041-1045. Hops are usually obtained from specialty suppliers in one of several forms, including liquid hop extracts, hop pellets, or as dried whole flowers or cones. Although the latter are still used, hop extracts and pellets have gained popularity due to their consistency and ease of use. Hop products can also be obtained as iso-merized extracts or pellets, containing iso-a-acids.This allows the brewer to add the hops to the wort during kettle boil, as well as later stages, so that the desired hops flavor can more easily be achieved.